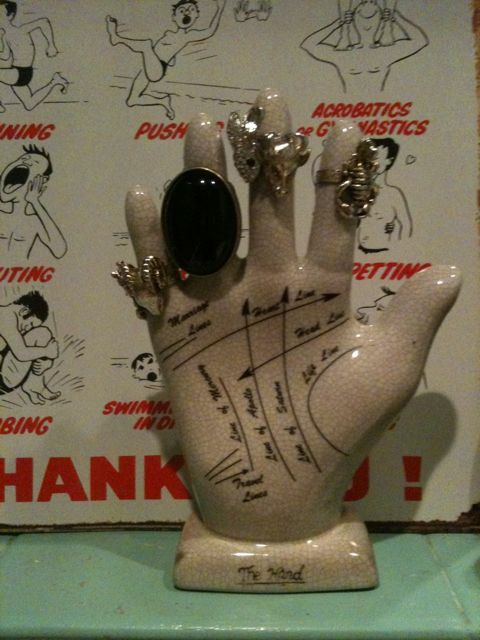 I’ve been eying up this palm reading dummy hand jewellery stand from Urban Outfitters for months, but it did seem like yet another example of Something Expensive That I Don’t Need. Joy of joys, then, to find this semi-replica vintage model on Portobello Road for a fiver. I think I like it better, even if it is just because it fits my homeware criteria of looking ‘old’. Only problem is that some of the fingers are even fatter than mine (didn’t think it possible??) and I can’t squeeze my rings on all of them. Might go back and buy one of the phrenology heads for storing… one hat?